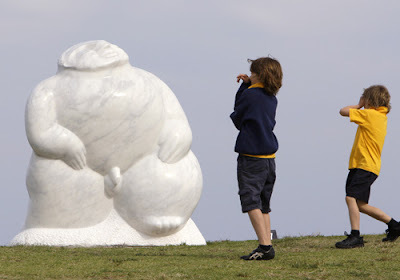 White fright ... taking place from October 16 until November 2, Sculpture by the Sea is Australia's largest annual outdoor exhibition of sculpture. 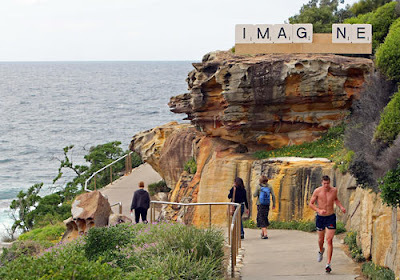 The free outdoor exhibition, now in its 12th year, stretches for two kilometres along the Bondi coastline. The display features over 100 sculptures from seven different countries, including this marble sculpture titled New Man. 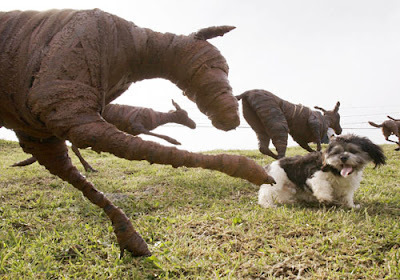 Gone to the dogs ... six-month-old Maltese puppy Mylo investigates a sculpture titled Mongrel Country-Nil Tenure. 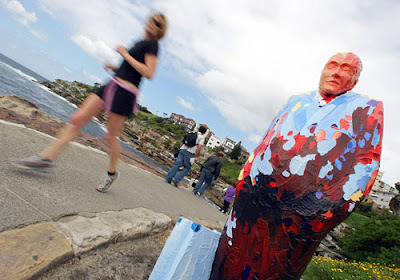 Colourful charatcer ... a jogger passes the rendered polymer plaster work The Drifter by Australian artist Stephen Marr. 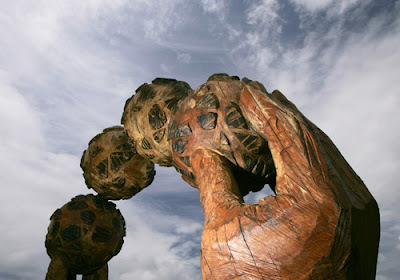 Give him a hand ... Stephen King's sculpture Carbon Trading. Colourful sea view ... Will They See Us? 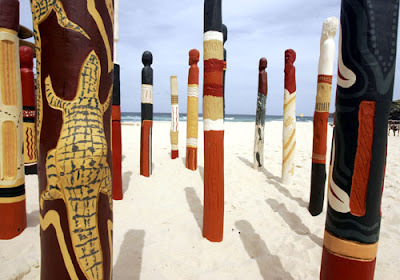 by Ngardarb Francine Riches. 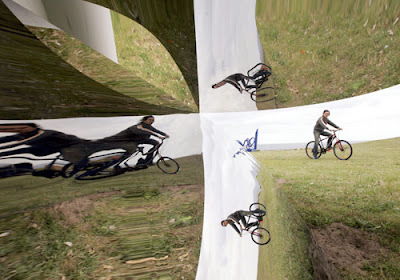 Reflective ... Form of Scenery by Japanese artist Koichi Ishino. 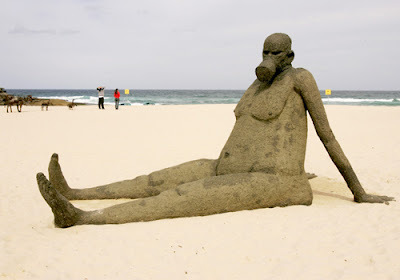 Slip, slop, slap ... Tim Kyle's On The Beach shows us the importance of sun screen. Strange forces ... 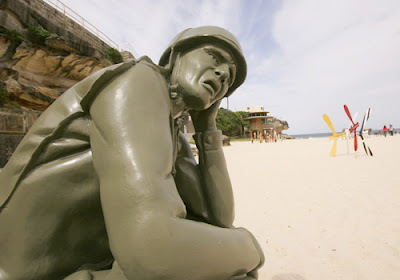 Soldier Scale 1:1 by Ruth Belotti & Steve Rosewell. 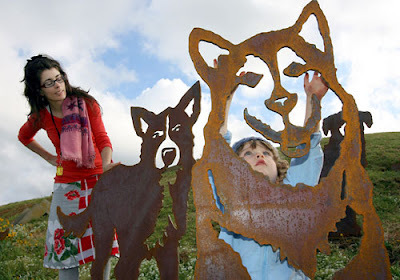 Pet portrait ... Lisa Charleston and son Huxley admire the sculpture Every Dog Has its Day. 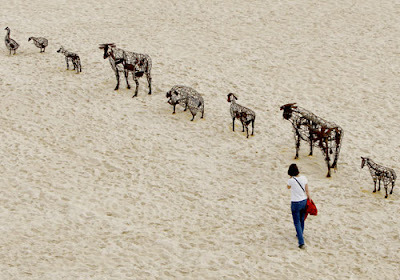 Walk on by ... Phenotype by Tim Wetherell. 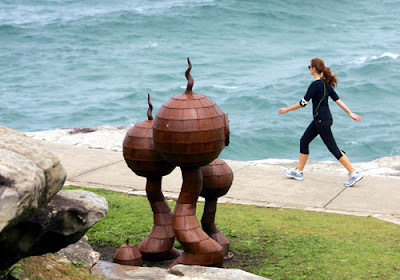 Scrabble scramble ... a jogger passes the timber and aluminium work by Australian artist Emma Anna. 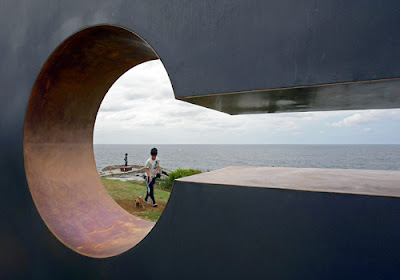 Lock it up ... a boy and his dog enjoy the mild steel and bronze work She Thought, by Australian artist Mark McClelland. 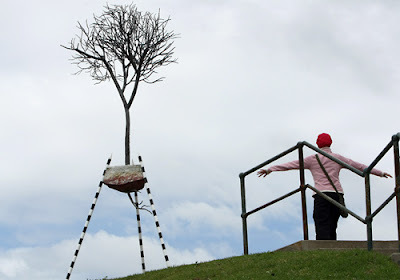 High tree ... a woman admires the forged steel and concrete work Fragment, by Australian artist Kevin Draper. Worth the wait ... Waiting by Andy Townsend and Suzie Bleach. 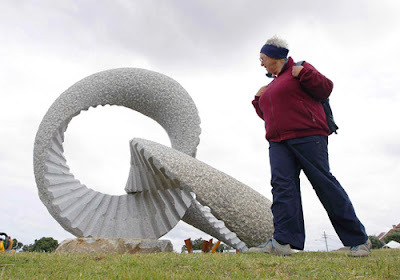 Spiral attraction ... a woman inspects a work by Japanese artist Keizo Ushio.